If you’re planning to move out of state, it’s easy to get swept up in the details of packing your belongings and making sure everything fits in the moving van — but the moving van isn’t the only vehicle you need to worry about. You need to know what you should bring in your car, and you should also check with your taxi service to find out more about their policies. 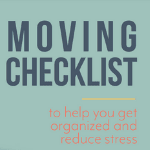 To ensure that your move goes as smoothly as possible, here’s a moving out of state checklist to help you know what to pack in your car. Want to skip to the checklist? Click here. As you prepare for the move, create a binder of all important paperwork to bring in the car. Include all the documents related to the sale of your old house and the purchase of the new one, including contact information for your moving company, real estate agent, and insurance providers. Also include your family’s identification documents, such as birth certificates and passports. Pack medical paperwork such as prescriptions, and bring important financial documents with you in the car. After hours or days on the road, nothing feels as good as a warm shower and a change of clothes. When moving, check the weather along your route and bring seasonally appropriate clothing—a few outfits for each family member. Designate one bag for toiletries such as shampoo and body wash, toothbrushes and toothpaste, prescription medication, and a first-aid kit. You can also set aside some cash to cover last-minute personal needs if your car is short on space. Bring a pillow and blanket for each person. These will help everyone stay comfortable in the car, and familiar textures can help ward off homesickness. If you have air mattresses, bring them to use in your new home before you set up your furniture. Most moving companies do not transport pets or house plants, so you should plan on bringing them with you in your vehicle. But your pets and plants will most likely thank you, as they often don’t travel well in moving vans. When you keep your pet with you in the car, you’ll help reduce their stress levels during the move. Pack their bedding, a carrier, food, and any medication your pet will need during the trip. Plants will also fare better in a car than in a moving van. The climate control and natural light in a car will reduce stress for the plant and keep it healthy during the transition. Whether or not you’re moving with children, you’ll want entertainment options. Load up a tablet with e-books, download a few new movies, or get some exciting audiobooks to keep everyone occupied during the trip. If you have a favorite food, bring some along in a container or cooler. Tasty, familiar treats can help reduce moving day stress. Bring your coffee maker and your favorite roast with you in the car. You’ll be able to brew a cup in a hotel room kitchenette, and you’ll have a delicious beverage to help you power through unpacking at your new home. If you follow the tips outlined in this article, you’ll be able to stay organized, comfortable, and cheerful throughout your interstate move. And remember, a professional moving company has valuable expertise; don’t be afraid to ask for help if you need it. Take a look at our infographic below to learn a bit more. Download a full-size version of this infographic here.